Falls are common types of garden accidents. Ladder safety is key to eliminating the chances of a fall when you are gardening. Using the correct ladder for the appropriate gardening task is very important. 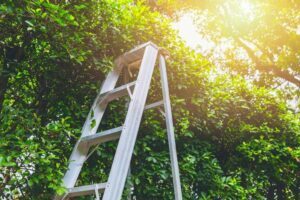 When it comes to jobs like hedge trimming, tree pruning and picking fruit, a traditional stepladder won’t be sufficient. Tripod ladders are specially designed for tasks like these and are much safer alternatives to use. Aluminium tripod ladders have three legs instead of four which allows the ladder to create a wider base which ensures all of the feet remain in firm contact with the ground. This is even the case when working on different terrains like ditches, slopes, and steps. Having this extra level of stability is a must as most garden areas are not completely even. There are different models and sizes of tripod ladders available, each model has different features to suit different situations and the user. Some models have more steps, some have bigger dimensions than others. Here is our full range of aluminium tripod ladders. The GMF standard tripod ladder comes in 4ft, 6ft, 8ft, 10ft, 12ft, 14ft and 16ft sizes. The GTL heavy duty standard tripod ladder comes in 8ft, 10ft and 12ft sizes. The GWF tripod ladder platform comes in 6ft, 8ft, 10ft and 12ft sizes. The HPM 3 leg adjustable tripod ladder comes in 6ft, 8ft, 10ft and 12ft sizes. These ladders are made with high-grade aluminium, the tripod is robust yet incredibly lightweight. They are durable material that don’t rust, are easy to transport and store in the home so no matter what age you are they are the perfect tool for your garden. When it comes to the task of hedge cutting, aluminium tripod ladders excel and make the task simple and hassle free. They are ideal for positioning by a hedge, as you can position the front leg into the hedge itself or angle it alongside the hedge whilst remaining stable. These ladders are extremely stable too when working at a height which of course is likely to reduce the chance of accidents. To get a tripod ladder, visit us online today or call us on 021-496-5132.